For centuries women have been fighting for housing rights and many have turned to the co-operative model to provide security of tenure, affordability, and opportunities for member involvement. 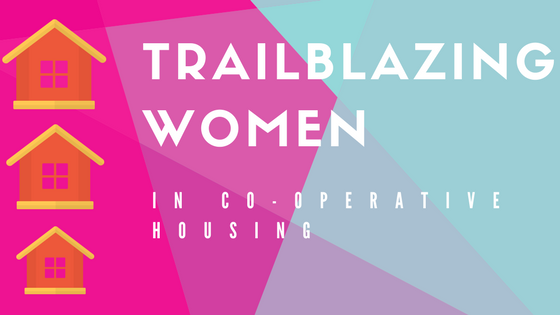 In this issue, we are featuring trailblazing women who have made significant contributions to co-operative housing around the globe. These women have changed the housing landscape for the better and have empowered many others to follow in their path and advocate for housing that is not driven by profit but by values and principles that are in sync with their own values. Alexandra Wilson discovered a passion for co-operatives in 1974, when she led her neighbours in converting 260 rental flats in downtown Toronto into a housing co-operative, putting a stop to the owner’s plans to evict the low-income tenants. Her involvement in saving her own home led to professional roles in the development, management and provision of association services to housing co-operatives, locally and then at the national level. 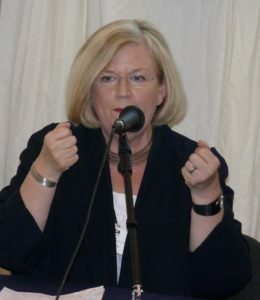 Alexandra served as executive director of the Co-operative Housing Federation of Canada for 15 years. From there she moved on to start up the Agency for Co-operative Housing, becoming its CEO in 2005. The Agency oversees federally-funded housing co-operatives in four Canadian provinces, providing risk-management, compliance-management, default-management and information services. An early adopter, Alexandra recognized the importance of collecting and analysing financial and other data from housing co-operatives and sharing it back with them to use in improving their operations and, in some cases, to secure new financing. Alexandra’s determination, intelligence and dedication has been instrumental in shaping the co-operative housing movement in Canada. Alexandra’s other co‑operative experiences includes three years as manager of finance and special projects in the international affairs department of the Cooperatives and Mutuals Canada; six years’ service as chair of the credit committee of Alterna Savings Credit Union in Ottawa; eight years as a director and chair of the audit committee of Citizens Bank of Canada and Citizens Trust Company; and many years serving as a director and volunteer with three different housing co-operatives in Ottawa and Toronto. Since 2000 she has served as a member of the board of directors of The Co‑operators Group and several of its subsidiaries. Alexandra is also on the board of the first funeral co-operative in Ontario and was more recently elected to the board of the Alliance. Gun-Britt Mårtensson from Sweden, grew up in an HSB home (HSB is the 605,000-member union of housing co-ops) and finished her career as Chairperson of HSB. She became active in politics with the Young Social Democrats in university in the late sixties. After graduating, she worked in vocational rehabilitation and got involved in politics. A few years later she was elected to the municipal council of Ostersund. She eventually became mayor of Ostersund for 12 years where housing is a major responsibility in municipal politics. Co-operatives of all kinds are also prevalent in small municipalities as it requires co-operation for many services to even exist. Federal politics eventually drew Gun-Britt where she served on the National Housing Board and for many years was the national spokesperson for housing policies. The next chapter in Gun-Britt’s career was serving as chairperson of HSB. She was keen for HSB to operate according to its cooperative ideology and helped to develop a large number of value management processes and strengthened the role of long-term sustainability. During this period she also served on the board of Co-operative Housing International and Housing Europe. For six years Gun-Britt served on the Board of the International Co-operative Alliance. It was a period of interesting changes and dynamic presidents like Ivano Barberini and Pauline Green. After ten years, Gun-Britt retired from HSB but continues being active within co-operative organisations. For five years she served as president of the National Board of Coompanion, an organisation helping hundreds of co-operative enterprises start up every year. She also lectures about co-operative values and moderates debates on co-operation or housing policies. Once a co-operator – always a co-operator! When asked why there aren’t more women in leadership roles Gun-Britt says their natural reaction is to say no when asked to play a role that is out of their comfort zone. Men are more willing to say yes whereas women don’t think they can do it. Gun-Britt encourages women to say “yes” more often because organizations that look at all sides of society will benefit tremendously. She would like to see more female presidents, managing directors, engineers, architects, tradespeople, etc… When Gun-Britt started in HSB there were only 10% women on staff, mostly in administrative roles, and it rose to 64% by the time she retired. “You have to work at equality, just like you have to work at democracy” says Gun-Britt. Errum Sharif Bhaiji started working for co-operatives in Pakistan in 2004 when there were few women involved in co-ops. 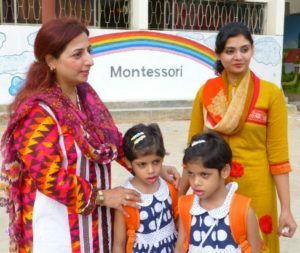 The dire need for co-operative development in Pakistan influenced her to change her career as a Credits Manager in a commercial bank and start working with her husband, Mohammed Sharif Bhaiji, with Karachi Co-operative Housing Societies Union. Errum has since developed a women’s co-operative wing and is currently working on expanding a co-operative school and is also starting a co-operative college. Errum’s main focus has been on the development of women both on a personal and financial level. She helped set up a Montessori school that provides education to young girls and jobs to women. Errum has also helped with uplifting textile cottage industries run by rural women. In 2008, she was involved in establishing a small credit union for women working in farms in the village of Kathore in the Karachi district. Errum currently serves on the board of Co-operative Housing International. Linda Brockway, also one of Co-operative Housing International’s board members, serves as the Treasurer of the National Association of Housing Cooperatives (NAHC) in the U.S.A. and as President of Economic Consultants for Housing Opportunities (ECHO) that works with stakeholders, including the Department of Housing and Urban Development (HUD) to develop strategic and economic development plans, welfare reform and other self-sustaining programs to support the development of co-operative and affordable housing. 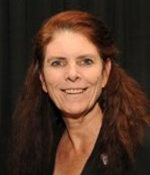 Linda was able to obtain a grant and a donation from the National Cooperative Bank, so that NAHC could hire a professional and an editor to develop the NAHC Governance Class. Over 40 housing co-operatives have taken the class, becoming NAHC’s most successful class and spearheading three other classes. Linda Brockway has been assisting public housing authorities, city and county governments, financial institutions, faith-based organizations, co-operatives and other non-profits in developing a place-based strategy to target grant funds and enhance strategic planning for housing development. Maureen Stables became a tenant of CDS Co-operatives in 1977 and was chair from 1982 to 2016. In that time, she saw CDS grow from 368 homes to more than 3,000. She helped the organisation make big changes in development too by joining the Kent Housing Partnership. 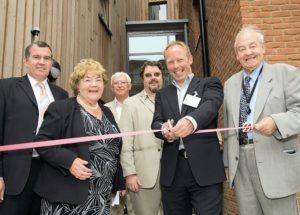 It developed 14 rented and two shared ownership schemes. 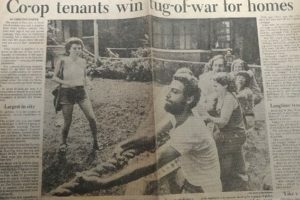 The tenants of the new homes went on a two-year training programme to become chairs, secretaries and treasurers, and CDS transferred the ownership and organised a long-term loan so the community could own it. Maureen also helped support the creation of the Co-operative Housing Finance Society, a financial intermediary which helps organisations like cooperatives to get mortgage funding. She’s done all this while caring for her second husband, who had Alzheimer’s for many years and her son who has multiple sclerosis. The UK’s Inside Housing Magazine Lifetime Achievement Award was awarded to Maureen in 2015. The judges said she had ‘built a successful organisation that spread the co-operative housing vision across the UK’ and empowered residents.